Sanatana Diamonds Inc., ("Sanatana" or the "Company") (TSX VENTURE:STA) (AIM:SAN) is pleased to announce that it has received the complete sample of caustic fusion diamond results from the Company's newly discovered Dharma Uttar kimberlite pipe. These samples were processed at the Thunder Bay Laboratory(1) of Kennecott Canada Exploration Inc. In total, 227 diamonds greater than 0.106mm have been recovered. Table 1 below shows the stone size distribution for this group of samples. conforming to the requirements of ISO 9001-2000.
fill was diamondiferous kimberlite. The test was negative. There are eight stones that sit above the 0.85mm sieve and these weigh, in aggregate, 0.14 carats. Their presence suggests a coarse distribution that parallels the diamond population recovered from Dharma (see news release dated December 20, 2007). The two kimberlites have similar diamond size distributions, however the diamonds from Dharma Uttar are described as being 41% white in colour and 19% having octahedral crystal habits. The colour, crystal shape and diamond count numbers from Dharma Uttar are different enough from those of the Dharma discovery (54% white and 32% octahedral) to suggest different diamond populations. The Dharma Uttar kimberlite was intersected by six drill holes. These are shown in Figure 1 which illustrates the magnetic anomaly at Dharma along with the drill collar and traces. To see an image of the total magnetic field from a ground magnetometer survey over Dharma and Dharma Uttar, please follow this link: http://www.marketwire.com/library/20080714-715sta_figure1.jpg. Dharma Uttar occurs 50 metres north of the Dharma discovery and together they appear to form a kimberlite complex of dykes, sills and pipes intruding into Proterozoic platform carbonates of the Hornby Bay Group. Interestingly coral and bi-value shell fragments have been observed in the volcanic breccias in this complex. These fragments cannot be derived from the surrounding country rock and must have been sourced from a younger rock higher in the sequence when the kimberlite erupted: the eruption event erosion has erased any trace of the younger rocks, and they are now only preserved in the kimberlite. This indicates that the kimberlite complex is Devonian or younger. The discovery of the Dharma kimberlite complex is significant as it represents the first kimberlites in a newly discovered Archean craton on the North American Continent. This craton does not outcrop and until the Dharma discoveries was inferred purely from regional potential field geophysics and the occurrence of diamond indicator minerals in the glacial till. The Company has recently received further collaborating evidence that an Archean craton lies beneath the platform sediments that cover our properties from a report recently received from Dr. William Griffin of Macquarie University in Sydney Australia. Dr. Griffin and his faculty assay the trace elements within diamond indicator minerals using laser ablation techniques. The results are then interpreted based on a large database from other kimberlites around the world. He reports that the indicators from the Dharma kimberite plot at temperatures and pressures within the diamond stability field, and derive a 38mW/m2 geotherm. (For comparison, the Slave Craton, which hosts the Ekati and Diavik mines exhibited a 36mW/m2 geotherm using the same technique. The cratons hosting the diamond mines in Siberia and Southern Africa have 40mW/m2 and 42mW/m2 geotherms respectively). The base of the lithosphere at Dharma plots at 180km depth, implying a 30km thick diamond window in the lithosphere beneath Dharma. Thermodynamic arguments indicate that to be stable over time, a deep lithospheric keel must be at least 400km in diameter. 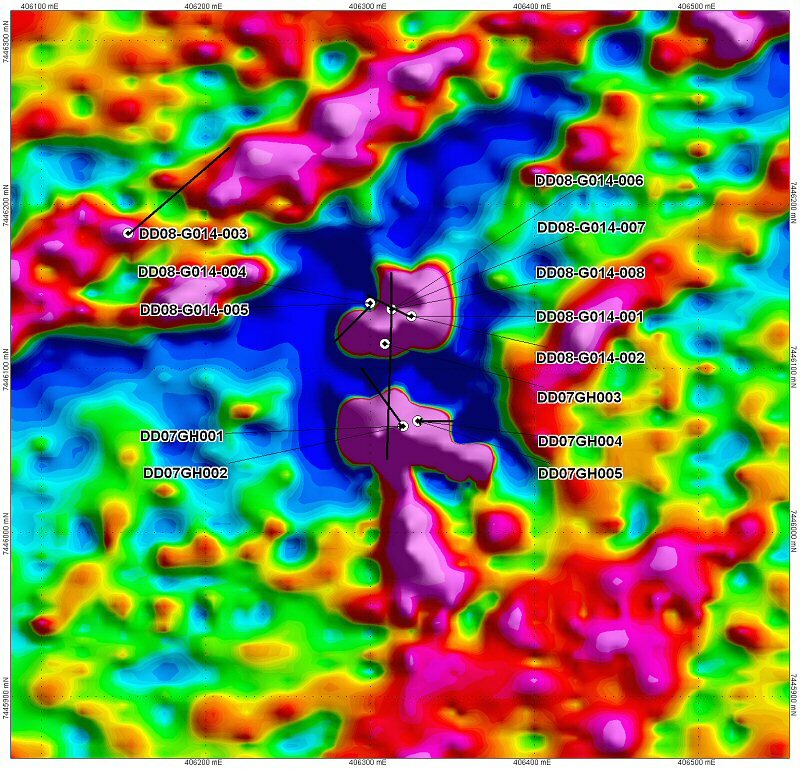 It is the Company's interpretation that Dharma occurs on the edge of this newly discovered "Mackenzie" Craton with the centre being 300km to the west in the vicinity of Colville Lake. The Company has recently tested 13 additional magnetic anomalies at Greenhorn utilizing a recently purchased, helicopter portable RC drill rig. Although no additional kimberlites have been discovered, the RC rig has significantly enhanced, in a cost effective and timely manner, the Company's ability to test drill targets. In order to better define future drill targets in the Greenhorn area the Company is currently undertaking closer spaced till sampling to further develop geochemical indicator anomalies distal to the Dharma kimberlite complex discovery. The Company is also pleased to announce that ground magnetic surveys are underway at Colville Lake and a drill rig has been secured to test approximately 15 priority targets. At least 6 of these targets have indicator chemistry coinciding with prominent magnetic geophysical anomalies. The indicators include the full spectrum of minerals you would expect from a diamond bearing kimberlite; pyrope, eclogitic garnet, ilmenite, chromite, chrome diopside and olivine. In addition, the indicator chemistry in the till at Colville Lake is superior to that of the till in the Greenhorn area in that it contains more numerous high sodium eclogitic garnets and high chrome G10 pyropes. Drilling is scheduled to start near the end of July. The Company's exploration programs are carried out under the supervision of Sanatana's Director and VP of Exploration, Mr. Buddy Doyle. Mr. Doyle meets the qualified person requirements (as defined by National Instrument 43-101) with 26 years of exploration experience, 16 years of which are in diamond exploration. Mr. Doyle has compiled, approved and reviewed the scientific and technical information in this press release. Sanatana Diamonds Inc. is focused on the exploration of its Mackenzie Diamond Project, comprised of approximately 5.9 million acres of ground under claims and permits, located north of Great Bear Lake and approximately 700 kilometres northwest of Yellowknife in the Northwest Territories of Canada. The Sanatana Mackenzie project is a joint venture between Kennecott Canada Exploration Inc. and Sanatana Diamonds Inc., which Sanatana operates and Kennecott has a contributing 15% interest. As part of the joint venture arrangement, Kennecott has made available one of their project geologists and a geophysicist from their pool of experienced staff. Sanatana Diamonds, headquartered in Vancouver, is dual listed on the AIM Market of the London Stock Exchange plc and Toronto Venture Exchange (TSX VENTURE:STA) (AIM:SAN). About this company Sanatana Diamonds Inc. Figure 1: An image of the total magnetic field from a ground magnetometer survey over Dharma and Dharma Uttar. For scale, the figure is 450m across.